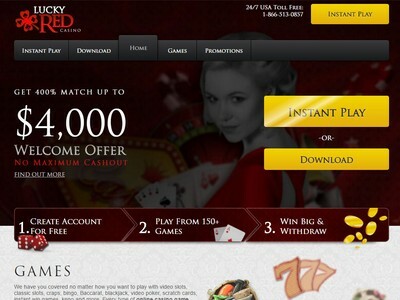 Lucky Red Casino is powered by downloadable and non-downloadable Realtime Gaming software. Register a new account here and you will automatically qualify for a massive 400% welcome bonus worth up to as much as $4,000. For example, deposit $100 and you will end up with $500 to play with. Registered members can also take advantage of some fantastic Daily Promotions. Players can contact the customer support here 24 hours per day via Chat (live chat), Email, Fax, standard Mail or by Telephone: (US toll free telephone 1-866-513-0857). Although the support is available 24 hours per day, the live Chat feature may occasionally be offline. This trustworthy online casino can only be displayed in English, it is licensed in the Netherlands Antilles and it is owned by a reputable operator called Club World Group, which also owns several other trusted brands. The main game categories include Online Slots, Table Games and Video Pokers. Some of the most popular titles that we recommend checking out as soon as you sign up here include Bonus Poker (Video Poker), Gold Beard (Slot), Red Dog (Table Game) , Aztec's Treasure (Slot), Blackjack (Table Games), Ocean Dreams (Slot) and Keno (Table Game). Some of the most popular slots here include Mayan Queen, Loose Caboose, Achilles, Sea Captain, Aztec's Treasure, Diamond Mine Deluxe, Naughty or Nice, Paydirt, Santa Strikes Back, Mystic Dragon and T-Rex. The vast majority of video slots also have progressive jackpots to play for and some slots even have more than one progressive jackpot up for grabs. Downloading the software also means that you will be able to sign up for daily online slot tournaments, some of which are free to enter. Popular online casino banking methods that are accepted here include (in no particular order) Visa, Skrill/moneybookers, Instadebit, NETELLER, MasterCard and Click2Pay, plus various other well-known methods. Downloading the casino software will give you access to more than 100 exciting online casino games and there are some huge progressive jackpots to play for on games such as Shopping Spree, Let Em Ride, Caribbean Hold Em, Caribbean Draw Poker and Midlife Crisis.